This medium sized stingray (growing to 39 inches wide at most) has the classic rounded diamond shaped disc but a distinctively blunt snout, with a tail one and a half times its body length bearing a serrated venomous spine. It is yellowish to light gray on top, with a white or gray underside. Bluntnose stingrays like to live in coastal regions, but are nocturnal and spend their days buried in mud or sand with only their eyes showing, thus are considered little harm to people unless they are stepped on. In the English language, Dasyatis say is usually referred to as the bluntnose stingray or Say’s stingray. In other languages, common names include arraia-manteiga (Portuguese), manteiga (Portuguese), raia (Portuguese), or raia amarela (Portuguese); stumpfnasenstechrochen (German); stompsnuitpijlstaartrog (Dutch); and raya mediana (Spanish), raya hocicona (Spanish), and raya (Spanish). The bluntnose stingray is important to the tourist industry because of its popularity among snorkellers and scuba divers. This stingray’s venomous spine is also the subject of ongoing research in the biomedical and neurobiological fields. The bluntnose stingray is non-aggressive and poses little threat to humans. However, it will use its spine in self-defense when stepped on. To avoid this, one can shuffle his or her feet while wading in shallow waters. > Check the status of the bluuntnose stingray at the IUCN website. 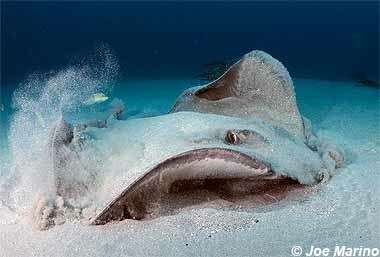 The World Conservation Union (IUCN) does not consider the bluntnose stingray to be a threatened or endangered species. The IUCN is a global union of states, governmental agencies, and non-governmental organizations in a partnership that assesses the conservation status of species. 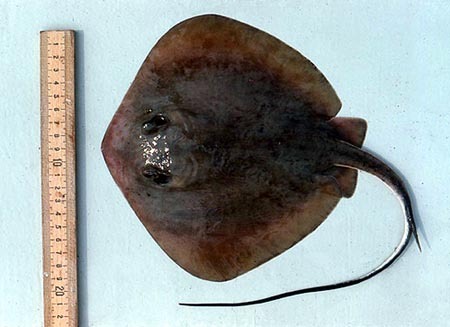 Although uncommon in occurrence, the bluntnose stingray can be found in the western Atlantic from New Jersey and Massachusetts in the United States. 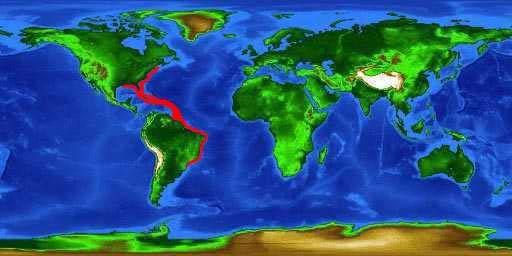 It also resides in the northern Gulf of Mexico as well as off the coasts of Argentina, Brazil, and Uruguay in South America. This species is widespread throughout the West Indies and the Antilles. However, there have been no recorded findings of this stingray along the coasts of Mexico, Columbia, Venezuela, or Central America. The bluntnose stingray prefers subtropical coastal waters, lagoons, and estuaries (41°N-40°S). This species resides near the shoreline in waters to 33 feet (10 m) in depth and appears to be most active at night during spring and fall, as indicated by their increased capture rate. These rays are not found in fresh water, preferring high salinity of 25-43 parts per thousand (ppt) over brackish environments. Bluntnose stingrays prefer water temperature ranging from 54°F-91°F (12°C-33°C). Adults are more commonly found in depths greater than 3 feet (1 m). This stingray spends large amounts of time buried in mud flats or sand with only the eyes and spiracles exposed. During the winter, in northern regions of their distribution, bluntnose rays migrate from coastal areas into estuaries. The bluntnose stingray is a moderately sized stingray characterized by a distinctively blunt snout. Its lozenge-shaped disk has rounded corners with few tubercles and spines along the midline. This species has a highly developed fold on its dorsal surface and on the ventral surface of its long whip-like tail. 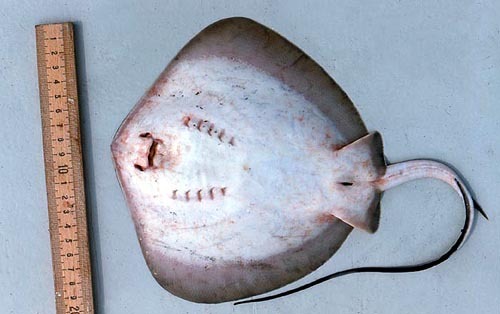 Other species that are similar in appearance to the bluntnose stingray include the Atlantic stingray (Dasyatis sabina). However the disk shape differs greatly between the two species and can be used to avoid confusion. Dorsal coloration varies from yellowish to light brown. Ventral coloration ranges from white to light gray. The upper jaw of the bluntnose stingray protrudes slightly at symphysis while the lower jaw is indented, leading to a slight overbite. Thirty-six to fifty rows of teeth are located in the upper jaw. The bottom of the mouth has a cross row of three wide papillae with a lone, small papilla on each side. Each tooth has a quadrangular base. During the mating season, adult male teeth develop wide, triangular cusps for grasping during copulation. Females and juveniles have rounded cusps. Dermal denticles, characteristic of elasmobranchs, are less developed in Myliobatiformes. A row of tubercles with crest sloping anteriorly are present along the mid-line of the dorsal surface of bluntnose stingray. As the ray grows it develops 1 to 2 short rows of large tubercles on each shoulder. Mature individuals have small prickles present on the dorsal surface anterior to the eyes and along the outer posterior parts of the disc. Bluntnose rays are known to be as large as 39 inches (100 cm) in disk width (DW). Females are slightly larger than males, usually reaching maturation at 19.7-23.6 inches (50-60 cm) DW and 15.4- 33.1 pounds (7-15 kg). Males have a disk width of 11.8-15.7 inches (30-40 cm) and weigh 6.6-13.2 pounds (3-6 kg) when mature. The diet of the bottom-feeding bluntnose stingray consists mainly of small bivalves, crustaceans, and annelid worms. Additional prey include gastropods, amphipods, shrimps, fish, and crabs. Large fishes including sharks such as the bull shark (Carcharhinus leucas) are known predators of the bluntnose stingray. The bluntnose stingray was originally named Raja say by Lesueur in 1817. 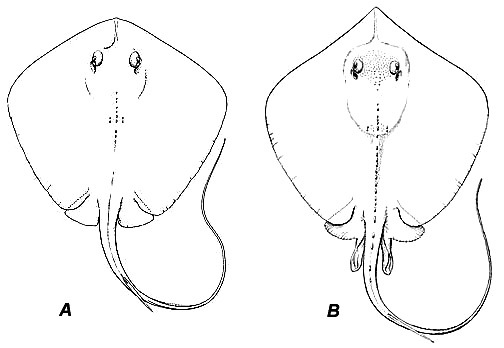 Although Dasyatis sayi Lesueur 1817 appears frequently in scientific literature in reference to this species, the currently valid name is Dasyatis say (Lesueur, 1817). The genus Dasyatis is derived from the Greek word “dasys” meaning rough or dense and “(b)atus” meaning shark. The bluntnose stingray is a member of the family Dasyatidae, commonly known as the “whip-tailed” rays.